U.S. Secretary of State Condoleezza Rice has won agreement from President Vladimir Putin to tone down Russian tough talk in an effort to improve strained ties, though neither side gave any ground on major disagreements over missile defense and Kosovo. Rice said no country could veto U.S. plans to set up a missile defense system in Europe that Russia vehemently opposes. She also said the United States still supports a U.N. plan for independence for the Serbian province of Kosovo, an idea Russia opposes. Rice told Ekho Moskvy radio that "it's important now to recognize that Kosovo will never again be part of Serbia," according to a U.S. State Department transcript of the interview. "It's not possible." She and Russian Foreign Minister Sergey Lavrov were collegial at a news conference Tuesday where they were peppered with questions about contentious issues. They stressed areas of cooperation, including the war on terror and efforts to halt the spread of weapons of mass destruction. "There will always be situations where our positions do not coincide," Lavrov said. He attributed talk of a "catastrophic" breakdown in relations to media speculation about a new Cold War emerging between the former foes. He said Russia still believes that the planned European missile defense would be a threat to it. Rice was in Moscow for two days seeking to repair damage to U.S.-Russian relations before a planned meeting next month between Putin and U.S. President George W. Bush at a summit of G-8 leaders in Germany. However, she gave no hint the United States was willing to back down on its plans for European missile defense. "The United States needs to be able to move forward to use technology to defend itself and we're going to do that," she said. "I don't think that anyone expects the United States to permit somehow a veto on American security interests." On Kosovo, Russia opposes independence for the province from Serbia and fears it could set a dangerous precedent for some restive Russian and former Russian republics. Rice and Lavrov said no progress had been made in bridging differences. "I can't see a ready solution," Rice said at the news conference with Lavrov. He said the same: "It was agreed to search for a solution on Kosovo that would be acceptable for all, but there is no such solution immediately in sight." Before their meeting, Rice criticized the Russians for recent negative comments by Putin and other officials that she said had obscured positive developments and cooperation. 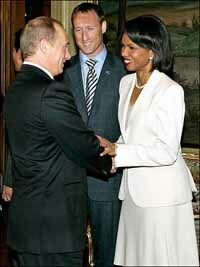 "We did talk about the need to keep the temperature down," Rice said after meeting Putin at his home outside Moscow. She described some remarks as "overheated rhetoric," in particular his recent reference in a speech to Nazi Germany, widely perceived as criticism of the United States. "We are going to have our differences, there is no doubt about that. There are going to be old scars to overcome, there is no doubt about that. ... But the relationship needs to be free of exaggerated rhetoric," she said. Asked whether she thought her message was received by the Russians, Rice replied: "I sure hope so, because I don't think you ever hear President Bush use certain kinds of rhetoric about Russia because he respects the partnership." She said she accepted Russia's explanation that Putin had been referring to "extremists." After the Putin-Rice meeting, Lavrov said: "The president supported the American side's understanding that it's necessary to tone down the rhetoric in public statements and concentrate on concrete business." But at the news conference, Lavrov appeared to step back, saying that "it would be more appropriate to consider the statements ... as an invitation to a more fair and frank dialogue." There has been growing tension about the U.S. missile defense plan and concern in Washington about Moscow's treatment of its neighbors, and steps Putin has taken to consolidate power in the Kremlin _ seen as democratic backsliding - as Russia prepares for presidential and parliamentary elections next year. A planned event at which Rice and Putin were to be photographed together and make brief remarks was canceled by the Kremlin, and a senior Russian diplomat on Monday warned the U.S. not to try to go it alone in world affairs. In April, simmering Russian anger over U.S. plans to place missile defense components in Poland and the Czech Republic, both former Warsaw Pact members, boiled over despite Washington's pledges to cooperate with Moscow on the system. Last month, hours before the United States and its NATO allies met in Norway to discuss the matter, Putin threatened to suspend Russia's participation in a key treaty limiting military deployments in Europe. Russia views U.S. activity in its former sphere of influence with growing suspicion. Just last week, Putin denounced "disrespect for human life, claims to global exclusiveness and dictate, just as it was in the time of the Third Reich."